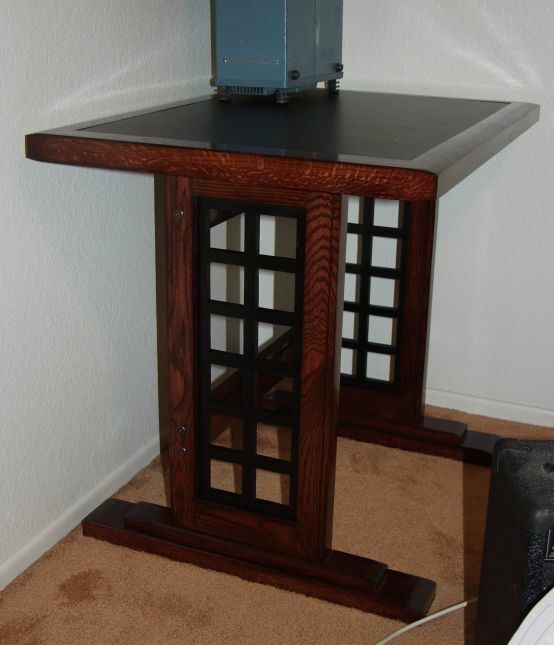 One day, I realized I was tired of my decrepit, 15-year-old particle-board computer desk, and after looking at the crappy and overpriced store-bought models, decided to build my own. This launched my new hobby of woodworking. 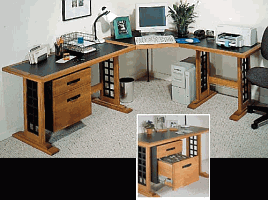 I found plans for a desk I liked on Wood Magazine's store site. 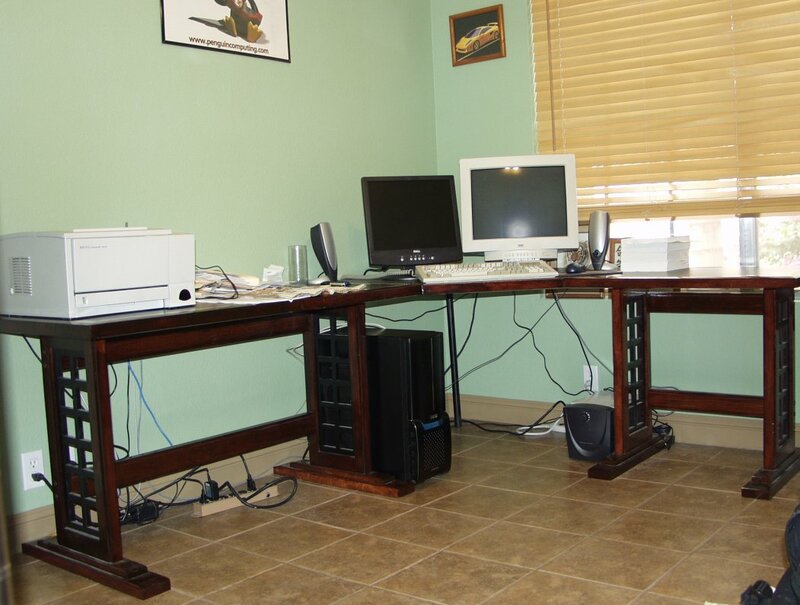 It's a 3-piece corner desk, with two side tables and a third section that fits into the corner where the monitor and keyboard are located. With black plastic laminate work surfaces and oak legs, I really like the look, and the simple rectilinear styling. I believe this desk is supposed to contain elements from the Craftsman style of woodworking and architecture, which has many things in common with the Prairie and Arts & Crafts styles of the early 1900s in America. 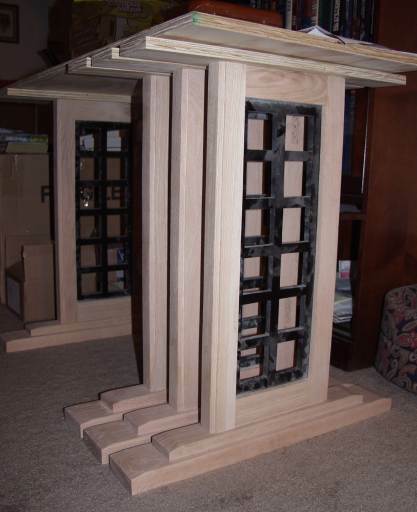 I first built all four leg units, and the stretchers that join them. In addition, I modified the design so that most of the desk can be disassembled ("knocked down") easily, using special fasteners. 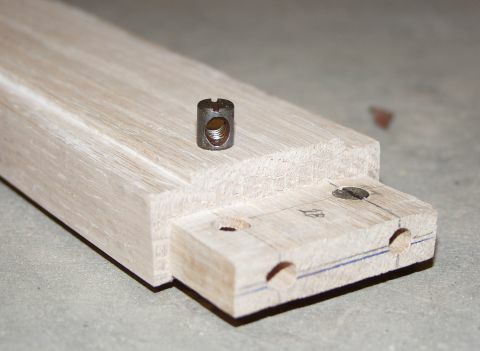 The stretchers that join the legs, for instance, are normally joined with mortise-and-tenon joints, which are glued together. I modified this by omitting the glue, and adding antique brass bolts and threaded inserts. This desk was also made with red oak wood, rather than the typical quartersawn white oak that is normally used for furniture of this style, because of cost. I didn't want to use a more expensive wood for my first project, plus I decided that red oak looked good enough. Now that a couple of years has passed and I've looked at other furniture by other woodworkers, I've decided that while I like many elements of the Craftsman, Arts & Crafts, and Mission styles, I'm really not that drawn to the quartersawn white oak with its characteristic "flecks". 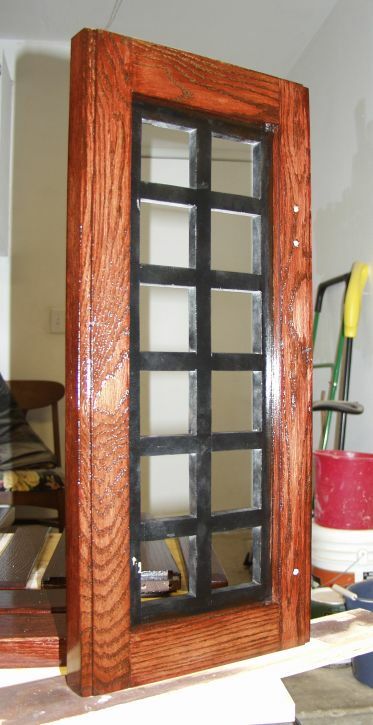 I finished the oak using two coats of Minwax red mahogany stain, and three to four coats of Minwax high-gloss polyurethane. So far, I've assembled the both table units and the center section, and have installed them in my office. My next step is to build the cabinet and drawers. I'm hoping those might help me reduce some of the clutter that's built up on the desk so quickly. I would probably keep the red oak, but I'd use a pore filler to fill the pores and make the finish smoother. When I built this, I didn't know about pore filling. I'd skip the Minwax stain and try my hand at aniline dyes instead. I haven't tried them yet, but from what I've read and seen about them, they look to be far superior to stain for the type of work I'd like to do. I might try thinning the polyurethane with mineral spirits and wiping it on, rather than using a brush. I wouldn't waste time with the tiny Delta benchtop saw I first got with its horrible, inaccurate fence and wobbly blade. I'd get a Ryobi BT3100 right away. I'd get a planer (thicknesser) before starting on this project. I have one now and wish I had had it long ago. I wonder if I'll say the same thing about a jointer in the future.